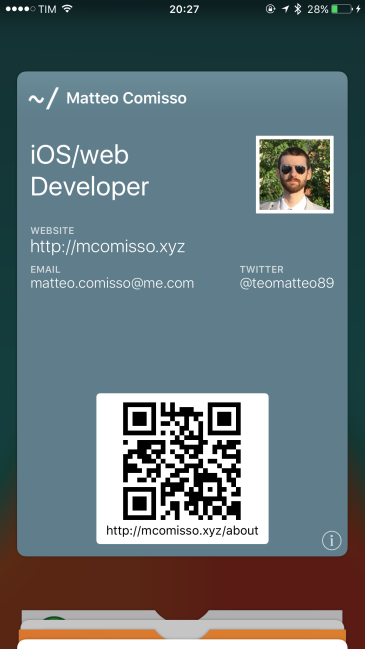 Since I’m kinda a social awkward guy, I’ve decided to create a little pass for the iOS Wallet. The idea is to share it online, and make it pop onto the display when someone is getting close to me, just to say “Hi” and/or share contact information. A standalone application to distribute would be a dumb choice to make, since no one wants to keep a cv in their precious homescreen… but  wallet and its passes can come in handy. iBeacons are also silently issued by iOS, and such a not-so-much-known-functionality is inside passbook since iOS7. Making passes is super easy. A pass is just a json file, with a bunch of predefined images inside a directory named any.pass, plus the signing command signpass which sits in your $PATH since XCode installation. description localizable string Required. Brief description of the pass, used by the iOS accessibility technologies. Don’t try to include all of the data on the pass in its description, just include enough detail to distinguish passes of the same type. formatVersion integer Required. Version of the file format. The value must be 1.
organizationName localizable string Required. Display name of the organization that originated and signed the pass. passTypeIdentifier string Required. Pass type identifier, as issued by Apple. The value must correspond with your signing certificate. serialNumber string Required. Serial number that uniquely identifies the pass. No two passes with the same pass type identifier may have the same serial number. teamIdentifier string Required. Team identifier of the organization that originated and signed the pass, as issued by Apple. But we can add more keys to personalize it. It will kinda match this site palette, just for a bit of consistency. major 16-bit unsigned integer Optional. Major identifier of a Bluetooth Low Energy location beacon. minor 16-bit unsigned integer Optional. Minor identifier of a Bluetooth Low Energy location beacon. proximityUUID string Required. Unique identifier of a Bluetooth Low Energy location beacon. 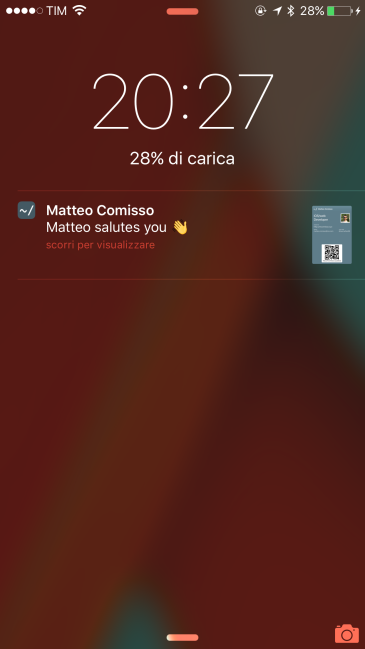 "relevantText": "Matteo salutes you 👋"
iOS will take care to scan for geofencing regions, and display it on the lockscreen when inside one. And yes, emojis. And the latest thing to do is call signpass with the -p option. You have to send it via email or downloading with http to your device.